Notorious gangster John Dillinger's thank you letter to Henry Ford for making a great getaway car's widely considered to be a hoax. It isn't, but Ford covered up the real letter, likely parading a forgery for decades. Jalopnik's exclusive investigation found the same thing other historians had found when examining the "thank you" letter to Henry Ford, a document used by Ford for decades to promote their V8 engine lineup — it was a fake. But we went a step further, meticulously examining Henry Ford's FBI file obtained through a Freedom of Information Act request. In that file we found a second letter sent by Dillinger to Henry Ford, one predating the fake letter. Through discussions and work with historians and other records, we've determined the first letter is likely real, and the second one was likely a hoax perpetrated by a Ford dealer or public relations official in 1934. Here's the full story. On March 3rd, 1934, America's first Public Enemy #1, John Dillinger, uses a fake wooden gun to fool the guards and escape from the "escape proof" Lake County Jail in Crown Point, Indiana. To cap off a day of embarrassing the cops, he steals Sheriff Lillian Holley's brand new Ford V8 and uses it in a crime spree across the upper Midwest, including gun battles in Wisconsin and Minnesota. Dillinger does such a good job evading the police and otherwise striking back at the law enforcement community for his imprisonment that Sheriff Holley tells a newspaper reporter "If I ever see John Dillinger again, I'll shoot him dead with my own pistol." Arrived here at 10:00 am today. Would like to drop in and see you. You have a wonderful car. Been driving it for three weeks. It's a treat to drive one. Your slogan should be, drive a Ford and watch all other cars fall behind you. I can make any other car take a Ford's dust. There are numerous problems with the popular telling of this story and the letter itself — the most obvious being Dillinger was almost certainly not in Detroit at the time the letter was sent. He was likely with his associates spotted in Chicago at the same time. According to Snopes, this was probably because people assumed that "Dillinger had been part of the gang who held up the Citizens Commercial Savings Bank in Flint, Michigan, on 18 May 1934. Dillinger was later determined to have been elsewhere at the time." There are more historical problems with the letter. In his attempts to avoid being spotted, Dillinger constantly stole, or purchased with cash, other cars. The likelihood of him driving one for the "three weeks" when he was being hunted by the police and the FBI is low. Finally, the letter was forwarded to the FBI by the Michigan State Police after arriving at Ford headquarters. In response, FBI Director J. Edgar Hoover sent back a note stating that the prints were compared with file information on John Dillinger and his associates and "no identifications were effected." This isn't conclusive, as the fingerprints were just as likely to be from Ford employees handling the letter as from Dillinger himself, but when compared with the other facts, it sheds more doubt on the missive's veracity. Another problem, noted by historian Bill Burck in his 1987 investigation of this issue for American Archivist, is the date on the FBI report: two days earlier than the letter was received. Burck jokingly comments on the time-traveling report by saying "Now that's efficiency... or something." It turns out the "or something" was an earlier — and entirely different — letter. Hidden for more than 75 years is another letter from John Dillinger to Henry Ford, predating the public one and with a stronger historical backing. This letter is postmarked from Minneapolis, Minnesota on May 6th, 1934. When Jalopnik contacted the Ford Archives about the letter, they were initially unaware of its existence. Archives staff confirmed the original was quietly in Henry Ford's possession before being passed on to the Henry Ford Museum; unfortunately, it's currently in such bad condition that it's unreadable by the human eye. Only with the use of infrared scanning techniques was a conservationist at the museum able to make out the text, which confirms what's in the FBI file. You can see from this image of the envelope below just how fragile the correspondence is. Historically, the letter is sound. On April 22nd, special agents from the Department of Investigations attempt to trap Dillinger and his gang in an inn nestled in the woods near Little Bohemia, Wisconsin. A gunfight ensues, with one agent and a tavern customer killed. Dillinger escapes in a 1930 Ford Model A (the car was sold at auction this year and is actually a four-cylinder model). The next day, Dillinger attempts to visit St. Paul, Minnesota, where his girlfriend Billie Frechette is being held by the police. Another gunfight ensues on the streets near Hastings, Minnesota. Gangster John Hamilton, also in the car, is shot but escapes alive. Hamilton dies from his wounds days later, and Dillinger ditches the bloody Model A in Chicago, exchanging it for a 1934 Ford V8 around May 2nd. With his girlfriend standing trial in St. Paul for harboring Dillinger in their Minneapolis apartment, he's got a strong incentive to return to the city he was attempting to visit in late April before being intercepted by the police. The real Dillinger letter is postmarked May 6th, the day after Frechette pleaded not guilty to harboring her boyfriend. This is how the FBI manages to get a letter back to the Michigan State Police and Ford before the letter was sent. The FBI wasn't referred to the now famous and publicly known second letter, but to this hidden secret letter. As mentioned above, J. Edgar Hoover says there's no handwriting or fingerprint match. There's likely a good reason for this. As Burck points out in his investigation, the handwriting samples they're comparing to were "produced under the watchful eye of lawmen (and for a purpose that gave Dillinger every reason to disguise his handwriting)," and "the fingerprints on the letter could have been from any number of Ford employees." To understand why Ford would fake a letter from John Dillinger when the company possessed a real one, it's important to review the text. The first, hidden letter is a short note thanking Ford for helping Dillinger evade the police. The second letter reads like a Ford brochure. Ford historian Bob Kreipke agrees that the second letter is a bit strange: "He's in town, suddenly he's writing like a Ford dealer," Kreipke jokes. "He's turned over a new occupation!" There's also the issue of timing. The FBI sends back the original letter with the inconclusive report on May 15th; the very next day, on May 16th, John Dillinger just happens to be in Detroit to write a new letter with language unlike a hardened criminal's short prose. He conveniently drops any references to embarrassing the police — a major Ford client. Kriepke is the foremost expert on Ford's history and worked with a few of the writers from that era. He says such a practice would be normal for the day. "We wanted to retell the story of how Dillinger liked the car, but we didn't want to get our copper friends pissed off, so they softened it," he explains. 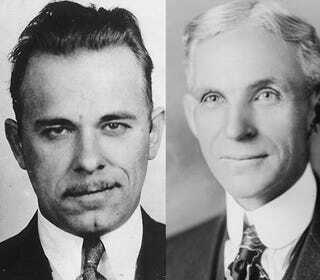 Adding more intrigue to the story of the second letter is the involvement of Harry Bennett, the infamous Ford executive introduced to Henry Ford after getting into a street brawl. Bennett was the head of Ford's goon squad, an infamous anti-labor enforcer, and a man once described as "a hangun-toting ex-convict." He was the first man fired by Henry Ford's grandson when the Deuce took over the company. "That adds another aura of mystery," Kreipke says. "You're not dealing with the vice president, you're dealing with a tough scoundrel." As soon as the second letter is produced, the first letter disappears. Documentation from the FBI proves it was sent back to Ford and stashed away, and the conservation report on the original letter notes that it was not well stored: "[It] appears as if the letter had been kept folded horizontally and vertically for a long time, causing rigid creases and folds. There are tears and missing elements along the edges." The second letter, however, was well preserved and touted by Ford in a press release for the opening of the Ford Archives in 1953. Even to this day, it's still cited by Ford PR people when they talk to journalists about their V8 engine lineup. Dillinger himself was gunned down six weeks after the letter was sent outside the Biograph theater in Chicago, so anyone who could confess to creating one letter or hiding another is long dead. Luckily, Kreipke believes our theory to be "very realistic" and that it matches evidence closely. According to him, when people around Ford speak of the Dillinger correspondence, they mention the reference to outrunning "the coppers," even though no one at Ford has seen the letter until Jalopnik rediscovered it. "They remember those first words [about the coppers], and that's what I think Dillinger might have written." Image Credits: Barrett-Jackson, The Henry Ford Museum, FBI, Ford Motor Company, JohnDillinger.com, LIFE.com. Additional Sources: The Northwestern, "Go Like Hell" by A.J. Baime (2009). Special thanks to the Ford Archives and the Henry Ford Museum.